Be A Game Changer By Joining Us For The 2012 Dallas Buddy Walk! You are here: Home / Family / Be A Game Changer By Joining Us For The 2012 Dallas Buddy Walk! It’s time for the 2012 Dallas Buddy Walk! The Down Syndrome Guild of Dallas will be hosting the 2012 Dallas Buddy Walk at Victory Park in a few weeks and we’re calling all of our blog readers to be one of Noah’s Game Changers! Keep reading…. We were in New York a few weeks ago to take part in the New York Buddy Walk (and see Noah’s picture in Times Square!) This will be the second year in a row for us to be a part of the Dallas Buddy Walk (be sure to check out my thoughts on our first Buddy Walk.) We’re excited to hang out with so many of the friends we’ve made in real life as well as meet some of the new ones we’ve meet through this site and our Facebook page. Will You Be One Of Noah’s Game Changers? Noah’s team name this year is “Noah’s Game Changers” and we’d love for all of the game changers who read this blog and / or hang out with us on our Facebook page to be a part of the “Noah’s Game Changers Team.” No matter where you live you can be one of Noah’s Game changers…here’s how! But if you are a developmental therapist, friend, facebook buddy, blog buddy, teacher, or just someone who wants to come out and support Noah and the Down Syndrome Guild of Dallas we’d love for you to be a part of our team! You can visit this link to sign up to be one of Noah’s Game Changers and join our Buddy Walk Team! 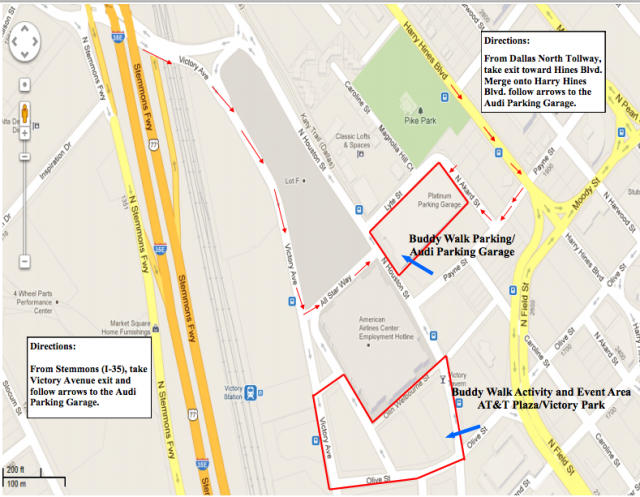 Here’s an event map for the Buddy Walk! The Buddy Walk is one of the major fund raisers for the National Down Syndrome Society and the Down Syndrome Guild of Dallas. As I mentioned both of these organizations do a great job supporting people with Down syndrome and their families, and any donation you make will go directly to helping them help others. Each Buddy Walk team sets a financial goal that they hope to reach as a team. To be honest I think our goal is pretty low considering how awesome (and generous!) all of you guys are. I never ask for money / donations on this site, but this is such a fantastic cause so I’m asking you to skip a latte (or two) this month and make a little donation to our Buddy Walk team. It would really mean a lot to us. Plus your donation will go a long way in helping others. Which is awesome! If you don’t live near us we would still love you to be a part of the Noah’s Gamer Changer’s Team by making a small donation. It’s super simple to donate. All you have to do is click here. Thanks so much! No matter where you live would you mind taking a minute to pray for all the Buddy Walks taking place all over the Word. Pray that God would use these Buddy Walks to help the world learn more about Down syndrome, and ultimately that more of these children would be brought to full term. Please be sure to leave a comment if you can commit to praying since being a “prayer partner“ certainly qualifies you to be one of Noah’s Game Changers! Words can’t describe how incredible the community is that’s formed around this site. It’s been an honor for us to get to know so many of you as you have commented on our posts, shared pictures and videos of your family on our Facebook page, tweeted us, etc. We don’t get the chance to reply to every comment and email, but we read (and appreciate) them all. (And I think we do a pretty decent job of replying back, all things considered.) Thanks for being such great friends. Yes, friends. For those of you who are new to our site be sure to check out our about page to learn a bit more about our site and see a list of some of our most popular posts. Also, if you haven’t already, please take a second to enter your email in the box below and be the first to know when we publish a new story. Thanks again, and we hope you’ll be one of Noah’s Game Changers! Have you been to a 2012 Buddy Walk yet? Leave a comment and tell us about it. (Bonus points for sharing a picture.) And be sure to let us know if you’ll join us as one of Noah’s Game Changers. We sure hope you will!